R.C. Sproul, Al Mohler, Stephen Nichols, and R.C. Sproul Jr. gathered in Sanford, Florida to speak on lessons from the Reformation and the relevance it has for us today. Audio and video are free to stream at Ligonier.org. Luther’s is an interesting study in the effects of media on the church. Trueman discusses Luther’s context and draws parallels to the contemporary church. All the way from the printing press to Twitter, join us for a fascinating discussion on a timely subject. 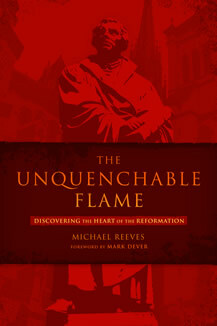 Mark Dever interviews Michael Reeves about the Reformation, and what we need to understand from it today. Michael explains how we’ve lost much of what the Reformation stood for, and how many of the problems we face today could be avoided had we applied the lessons of the Reformation. Reeves book, The Unquenchable Flame, has become a standard reading assignment for the interns at Capitol Hill Baptist Church. According to Mark Dever, this book is one of the most accurate, readable and motivational history books he has ever read.